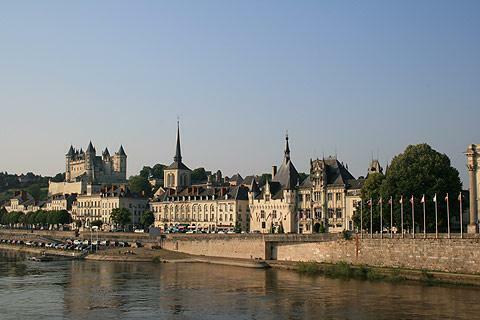 Saumur is an important town on the Loire river towards the south-east of the historical Anjou region, between Angers and Tours and in the heart of the Loire-Anjou-Touraine Regional Natural Park. 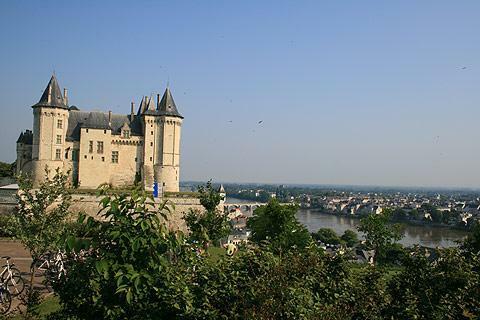 France This Way comment: although the Chateau de Saumur is one of the less interesting castles in the region, it provides an attractive backdrop to the town which also has several other sites of interest and historic monuments, many built with the white stone and grey slate rooves characteristic of the area, and a visit to Saumur is indispensable when you are exploring the Loire Valley. 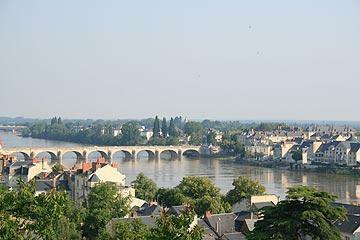 Start your visit from Saumur Tourist Office with a walk along the river front. 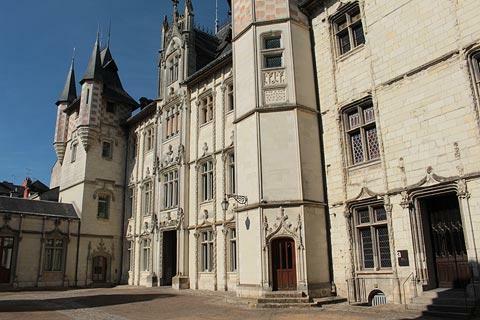 Pass the classical style theatre, an imposing building from the 19th century, to reach the Town Hall, a very impressive building that partly dates from the 15th century although a large wing was added in the 19th century, in neo-gothic style. 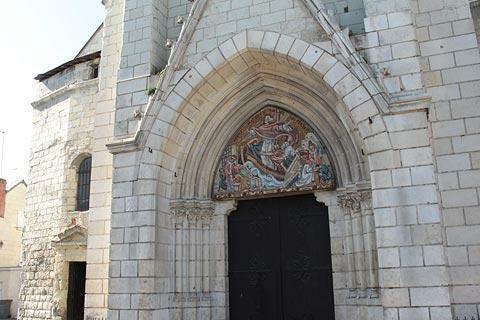 You can walk around the left side of the cathedral to see the rear of the building, which is equally impressive. 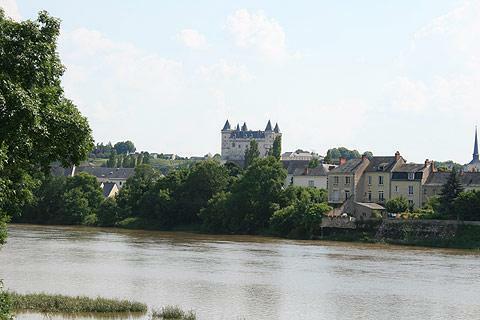 Continuing along the riverfont you reach the Hotel de Belvedere, a 19th century house in the classical style that was originally a hotel and features a belvedere overlooking the river, then a 15th century tower called the Tour Papegault which was a corner of the ramparts that surrounded Saumur in the 15th century. 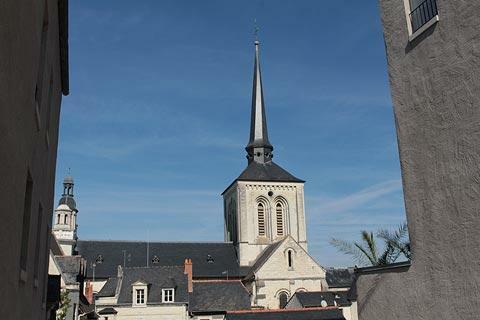 If you continue a few hundred metres further aong the river you can see the Chapel of Notre Dame des Ardilliers, most notable for the large dome added in the 17th century, as well as more imposing townhouses that belonged to the Mayaud and Charlemagne families. 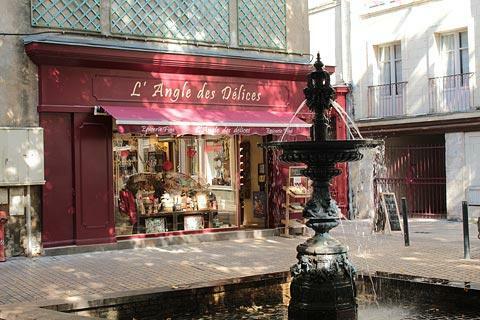 After exploring the riverfront you can take a pleasant wander around the town. 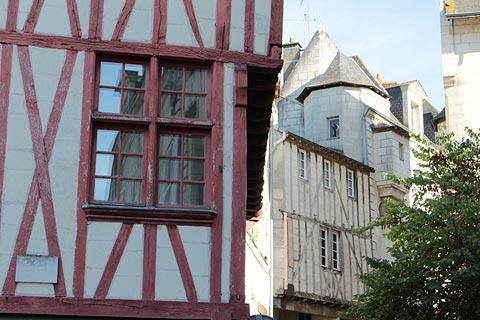 In the heart of the town centre you reach Place Saint-Pierre, which was the heart of medieval Saumur and still has several charming medieval houses in colombage that were built in the 15th and 16th centuries. 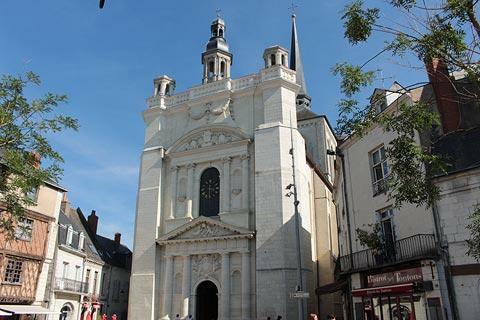 The Church of Saint-Pierre here was built in the 12th century although the facade that dominates the square was rebuilt in the 17th century. 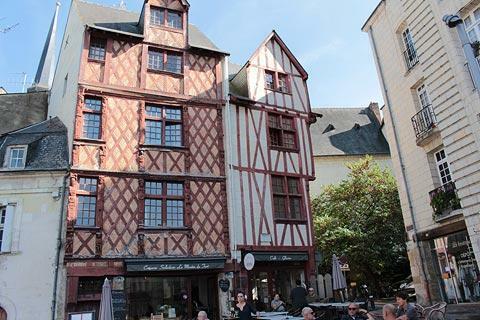 There are also several cafes around the Place Saint-Pierre which is a pleasant place to take a coffee break. 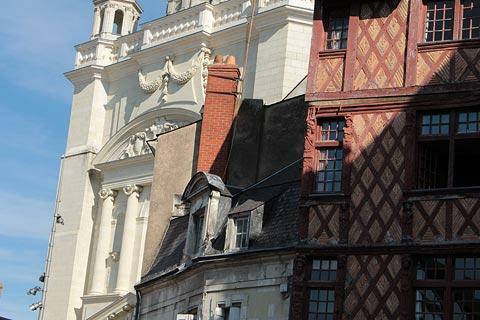 In the streets behind the large CPAM building which rather spoils one side of the Place Saint-Pierre (rue Dacier, rue de l'Ancienne Messagerie et rue Bizard) there are two more important buildings: the 15th century Maison du Roi, where many Kings and Queens stayed in the 16th century, and the Hotel des Abbesses de Fontevraud with its tower and facade rebuilt in the 19th century. 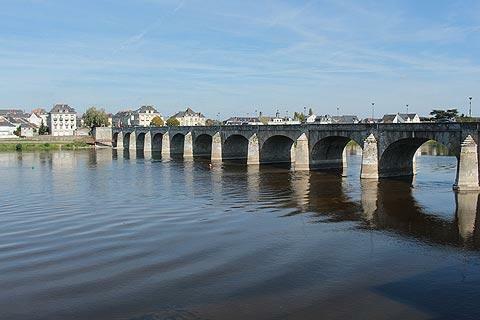 From the town centre you can climb up the steps to the château and enjoy some spectacular views of the town and the lovely stone bridge crossing the River Loire below. 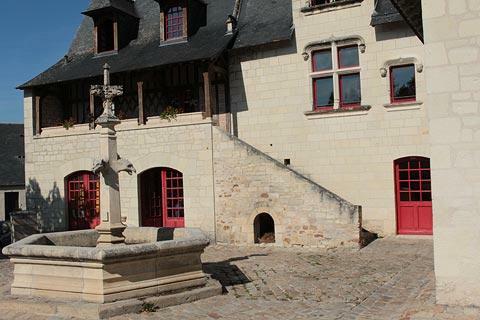 In the Château du Saumur you can visit several historic rooms and the museum that is inside the castle buildings. 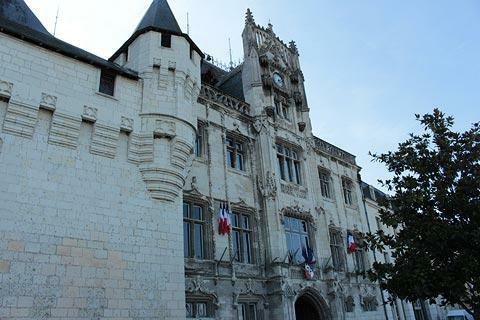 For details of the castle see Chateau du Saumur. When you have finished exploring you can take a well deserved pause to sample the delicious sparkling white wine ‘methode champenoise’ which is made in the region! 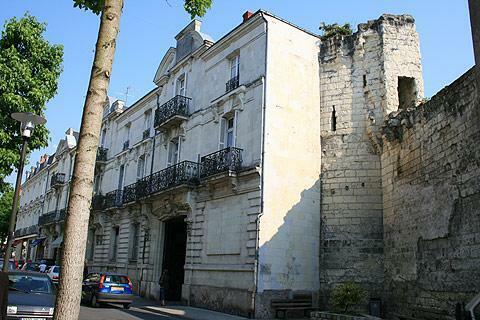 Saumur is famous for its elite riding squad, the Cadre Noir, and you can visit their base, the Ecole National d’ Equitation in St Hilaire St Florent, a suburb of Saumur. 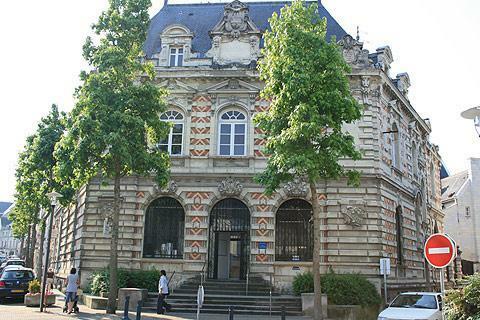 Various galas and shows take place throughout the year. 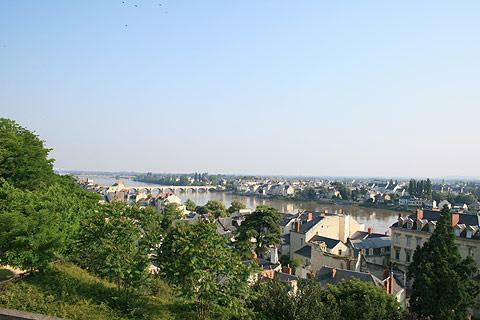 The region around Saumur is well known for its prehistoric traces such as troglodyte caves and dolmens. Until the dark ages these caves were a very popular place to live and you will see many as you tour the region. 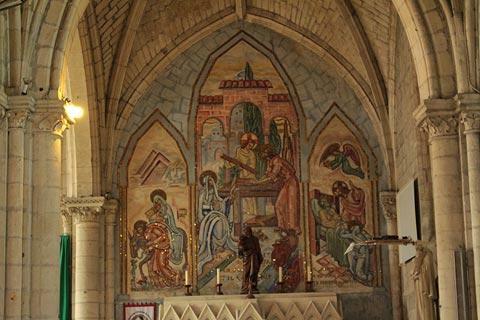 To the south of Saumur, those at Rochemenier are perhaps the most interesting, with a whole underground village being found in the carved out rock. The dolmen at Bagneux is also impressive. 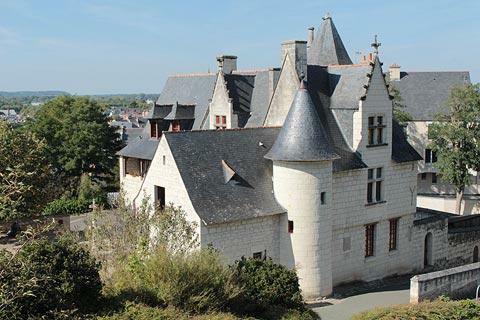 The renowned Fontevraud abbey is a short distance north of Saumur, and not far to the east you can visit the Manoir de Launay (the Manoir du Roi René), an attractive turreted manor house, built before the excesses of Renaissance architecture had completely pushed aside medieval simplicity.